GKN EVO eDrive Systems’ eMotor powered Team APEV to victory in the electric division of the 91st Pikes Peak International Hill Climb. Despite the wet weather conditions Nobuhiro ‘Monster’ Tajima completed the course in 9.46.530 minutes, setting a new electric record in the Monster sport eRunner. GKN Driveline partnered three of the seven racing teams in the electric division of the Pikes Peak International Hill Climb - a long-standing tradition in Colorado Springs. Covering a distance of 12.42 miles, the course begins at 9,390 feet and finishes at the 14,110 foot summit. The 2013 eRunner features GKN EVO axial flux motor technology which offers outstanding power and torque density. Michael Lamperth, Chief Technical Officer of GKN EVO eDrive Systems, supported the team during the week long preparations in Colorado. Second place went to the Mitsubishi i-MiEV, driven by Hiroshi Masuoka. The GKN Driveline Multiplate Limited Slip Differential (LSD) fitted in the front and rear axle of the EV-4AWD gave better control on the bends and prevented the vehicle from slipping on the wet track. For the second year GKN partnered last year’s winner Toyota Motorsport GmbH (TMG), supplying two eMotors, one to power each rear wheel. 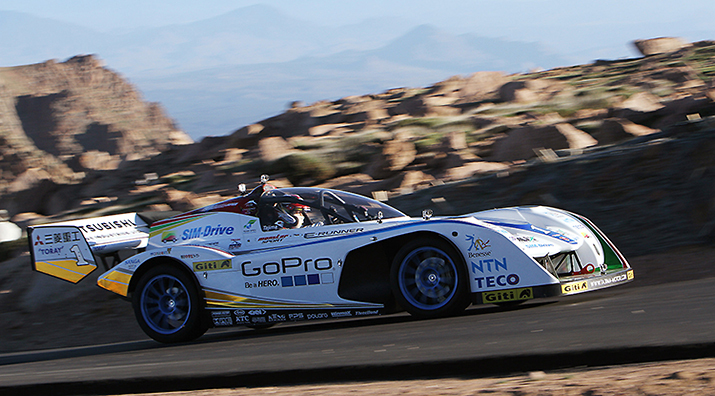 This year the TMG EV P002, driven by Rod Millen, achieved fourth place in the electric class. In 2011 GKN Driveline entered into a partnership with EVO Electric, a UK based pioneer in advanced electric drive solutions. This new venture – GKN EVO eDrive Systems – enables GKN Driveline to manufacture and sell electric motors and integrated eDrive systems, based on EVO’s axial flux motor technology, for use in hybrid and all-electric vehicles.